So, now that we are back at home I have a million and one ideas for blog posts. However, given the state of the children/house/piles of washing/my legs (I forgot to take a razor on holiday)/lack of food in the cupboards/episodes of Coronation Street to catch up on, today I am going to show you a picture of the cashmere crew neck jumper from Boden which came with me to Guernsey and which did a great of keeping me warm on the days that it was a little overcast! I have already found it so useful and know that I will continue to do so over the next few months. Pink and stripes are a match made in heaven for me so whilst it's more than I would normally pay for a jumper, I know that it will be worth it in the end. It's just one of those jumpers that will go with everything, from these cut offs, to smarter navy trousers, jeans and also my navy sequinned skirt. 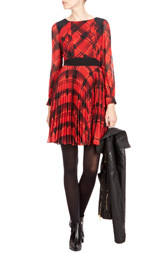 Oddly enough, having just checked at Boden, there's a 9 week wait for this jumper but only in a size 6. Given that they come up fairly snug (mine is a size 10 as I didn't want it too tight) I can't quite work out why that may be but in my experience a 9 week wait rarely translates into anything longer than a three week wait. I think that this is probably the last time that shorts will be featuring on Style Guile this summer, which is sad if only for the fact that it means that the summer may be coming to an end. However, life moves on, as does fashion, and with the new season approaching, there are plenty of exciting finds for me to bring your way. Today we visited the beautiful Channel Island of Herm, where we headed to Shell Beach, one of the most beautiful beaches in the world - well in my opinion at least! Given that it was warm enough for even me to don my bikini and go for a swim, I can't quite bring myself to write about darker colours so with that in mind, today I am looking at all things bright and beautiful. 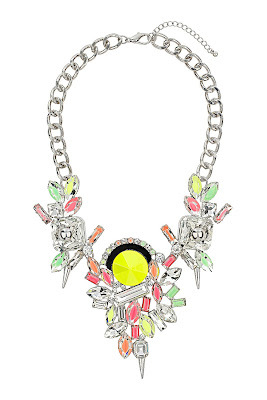 Keeping with the sunshine theme, and with all things beautiful, there's this neon necklace from Topshop. 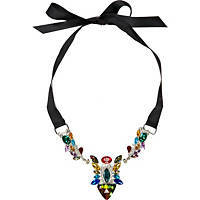 At £70 it's way up there on the higher priced side of costume jewellery but it would put a smile on anyone's face. If I'm going to have to think about next season, I'm happy to think about this Topshop fluffy boyfriend coat (£89). 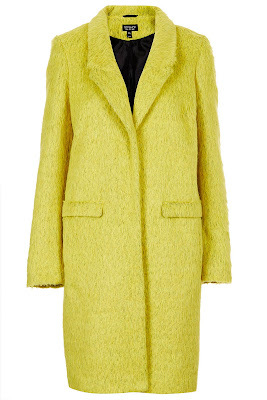 The bright colour is cheery and the fluffy texture is a huge trend for the season. There will be lots of fur gilets, fur coats, fluffy jumpers and warm, textured pieces, which is great for when it gets colder (ssshhhh). I found this hot pink sequinned cardigan in Karen Millen at Bicester a couple of weeks ago. I loved it but couldn't justify its existence in my wardrobe, so it may still be there. Not only would this go with brighter coloured pieces for now but it would also work well with black and grey in the winter, or with it being so fitted, with one of the fuller circle style skirts that are starting to appear in the shops. 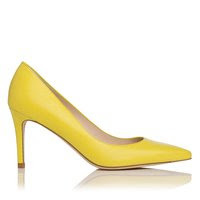 These lovely bright yellow shoes were in L.K. Bennett at Bicester. The staff there are really great at sending things out if anyone likes them enough to think about buying them. They don't give a refund though - just a credit note. These would look lovely with a smart, slim leg black trouser suit for work, or with ankle length jeans and an oversized grey jumper or sweatshirt, perhaps with the Topshop necklace above, for a more casual look. These aren't the Sledge shoes, which are the highest the LK Bennett do but either the Shiloh, Sabira, Sybila or Sabrina (how confusing?) and which are lower and easier to walk around in. 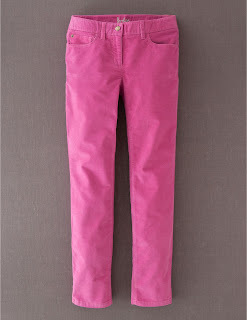 ...to include these pink ones too. Personally I would wear them with white, black, navy or grey on top to keep it simple but I have been known to mix two brighter colours together if in the right mood! If the idea of bright trousers or a bright coat are too much to contemplate, a bright bag is a nice option. 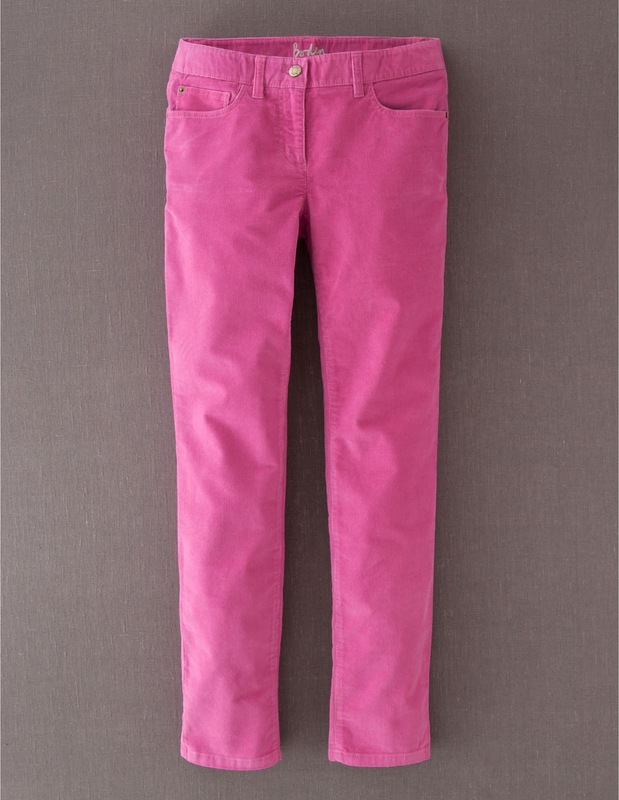 These were £75 from Marni at Bicester and come in this great range of colours. If Bicester is a bit too far away, I really like the Canonbury clutch from Boden as an alternative which cost £59. I hope that you like these choices and that wherever you may be, the sun is shining! For those not familiar with it, MYTRND is a fabulous site which allows brands to upload their look books for people to look at, rate, compare and shop from. There's a huge range to include Marni, Jonathan Saunders, Miu Miu and Milly, amongst others. 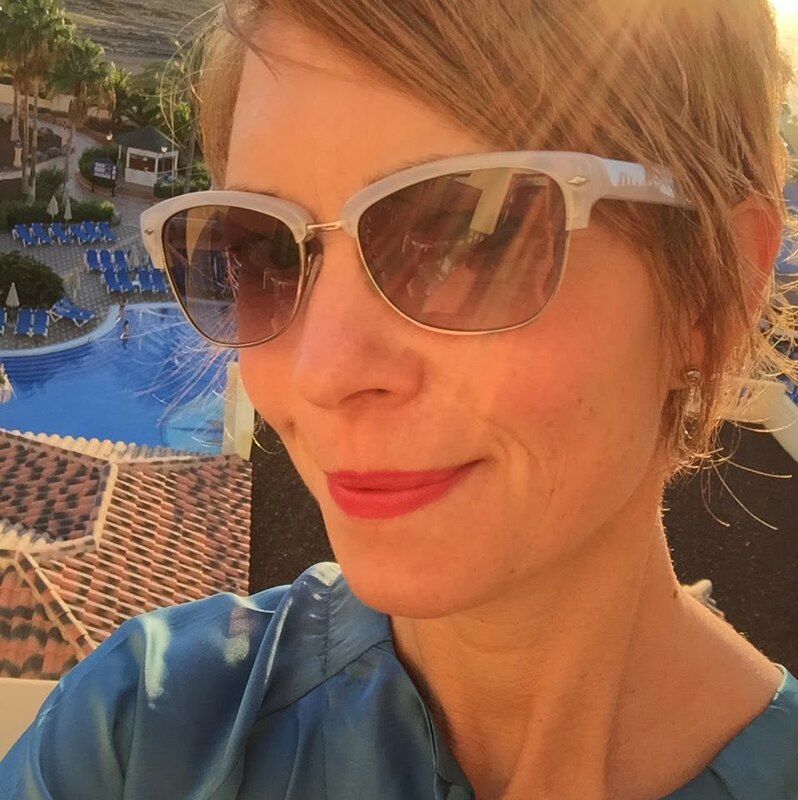 When I was asked to choose a brand about which to write, I wanted to choose one that was accessible from a price point, that had great design with pieces which were sophisticated but with a twist - hence my choice of the Danish brand, Baum and Pferdgarten. If you would like to read my review, you can do so below. The link to Baum and Pferdgarten's look book is below the main picture. I hope that you enjoy it! Turning the pages of the Baum and Pferdgarten A/W 13 look book, I was in style heaven. The collection contains everything that the modern busy woman could want in her life and in her wardrobe. It’s cool, effortlessly chic, refreshingly simple and sophisticated. For me, this collection epitomises everything that is so incredible about Danish design and styling. Clean, simple lines with an unparalleled attention to detail which takes a piece from being ordinary, to extraordinary. The strength of the collection lies not only in its beautiful simplicity but also in its accessibility. Whilst styling is essential, practicality is equally important. With snuggly parkas and full length wool coats, elegant knee length dresses, block patterned knitwear and pieces that can be layered, the Scandanavian appreciation of cold winters shines brightly! Whilst the silhouettes of the pieces are clean and uncluttered the clever use of print, colour, texture and detailing makes every piece varied and interesting. The collection is an endless surprise of contrasts. From modern animal and geometric prints, to the use of both muted and bold colours, from cuffed trousers to textured jumpers, simple shifts to skater skirts, elegant tailoring to relaxed separates, there’s something for every occasion. Baum and Pferdgarten has somehow created a strong brand identity, whilst at the same time giving us a huge amount of variety of styles, textures, fabrics, prints and colour – and all at a great price. For me this is my new “go to” brand. I hope that you like it too. A moment of monochrome magic, or madness perhaps?! OK, so here's my top tip for travelling and one that I really should adopt myself. Before arriving at the check-in desk, check that you have, in fact booked in two bags weighing 20kg each (as I had wrongly assumed) and not two bags weighing 15kg each - or else you will find yourself doing a hurried re-pack in the airport which will involve stuffing towels/pants and a various selection of items into the hand-luggage of your entire family. Oops and double ooops. Although we're away, I forgot to take any photos yesterday, which is a good excuse to wear the same outfit again. I did manage to give a radio interview though. There I was at the Normandy market buying nectarines in my best French when Guernsey's chief roving reporter shoved a microphone in front of my face and started interviewing me about the cost of school uniform. I didn't really have a chance to object. As to the outfit, a week or so ago I thought that I would wear what was a largely monochrome outfit, with shades of pale pink and silver added in to soften it. This jumper is the Zara one that I have packed for our trip to Guernsey, worn with a Hobbs statement necklace, Russell and Bromley pale pink bag, silver Zara shoes and white Gap jeans. Here's a closer picture of the Hobbs necklace, which I bought in the summer sale a couple of years ago now. Hope that you all have a fabulous bank holiday. I don't know about anyone else but I'm not buying into the view that it's the last hurrah of the summer. There's plenty of heat in that sun yet! Holiday packing - the why's, how's and why on earth? Tomorrow we go away to Guernsey, for our final break of the summer. It's a while since I have done a post on packing but I always like taking a look to see what other people pack for their holidays and adopting (or adapting) their tips and tricks to make things easier. For the beach/pool (I could be being ambitious here) I have a boy leg swimsuit from Seafolly. For similar, take a look here. I also have Crew sunglasses and my bargain Asda hat, which is similar to one that I saw in Liberty a while back now. A bit of tactical ruching on a swimming costume, combined with a lower leg can make for an easier piece to wear on the beach than some I can think of. I have a selection of tops which include two printed, one lace, one long sleeved, one striped, one sequinned and one neon. I like a wide variety of tops, largely to counteract the limited selection of bottoms that I take with me. Experience has taught me that if I'm warm, I'm comfy and that if I'm comfy, I'm not grumpy. Well, that's the theory at least. So I have packed four jumpers - plus a cardi for travelling. Even I shouldn't be cold then. From top left to right I have a coral H&M sweatshirt, mint cashmere jumper from All Saints, new Boden striped cashmere jumper and a black jumper from Zara which is a chunky cotton knit, slightly A-line with a zip up the back and pleats around the neckline. As I mentioned, I have a simple selection of bottoms - 2x Gap jeans, 1x Joules skirt and also a pair of cut-offs. That's all that I will need for trips to the beach and to neighbouring islands. We have one fancy pants event, which is my Dad's 70th birthday. It's being held at a Manor house on the island and is an evening event - but a fairly informal one. As part of it will be held outside, a flimsy little number won't do for me so I've opted for Jigsaw trousers (down to £79 from £139 in the sale) a Whistles sparkly jumper and Mango shoes. This photo gives a better idea of the print on the trousers. I'm also going to wear a new bangle/cuff that I bought in the Karen Millen sale at the weekend. I felt that the bright yellow and diamonds would add a nice splash of colour to the outfit. Are four bags excessive? Perhaps, especially when I'm only taking four pairs of jeans/skirts/shorts but here's how it works. The snake print bag holds the travel documents, which go in the Cath Kidston boat print bag, which I use as a handbag. To get around the limit of one piece of hand luggage, the Cath Kidston handbag goes into the larger Cath Kidston bag which also holds my laptop and that counts as my hand luggage for the aeroplane. The striped bag is a beach bag into which the snake print bag goes with purse/keys/phone in it when I go on the beach. See, it all makes perfect sense! As well as a good selection of tops and bags, I like a good selection of cuffs, so in addition to the Karen Millen one I also have the ones below, from left to right top row - Cochinelle, Cath Kidston, Tory Burch, Cath Kidston, Tokyo Jane and La La Rocks. To save on the weight restrictions I could well be wearing them all at once. Which gets me thinking, between us we have 10 wrists. Time to go and get some more to add to the collection. Skincare - Boots face wipes, Estee Lauder advanced night cream (which I use in the daytime at the moment too) and Estee Lauder advanced night repair eye cream. Hair care - VO5 styling wax. Maybelline master smoky eye pencil in navy. Boots nail polish remover pads and stay perfect nail colour in Me! Me! Me! And here's one thing that I will NOT be taking with me. I saw it in H&M the other day in the maternity section. Imagine sporting that on your bump. Brilliant! 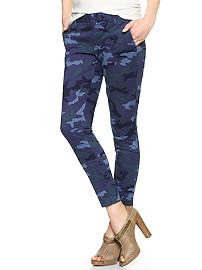 For those with skinny pins, or who would prefer a print on their bottom half, the GAP skinny mini trousers in blue camo are a pleasant alternative to the traditional green print camouflage and somehow seem a little less scary. They also come in a pale grey and cost £34.95. I like the colour combination of the trousers and shoes below, which would translate well into a pair of ankle boots for the colder weather. Wear with a chunky jumper, maybe blue or bright yellow or pink, and that's an outfit sorted. 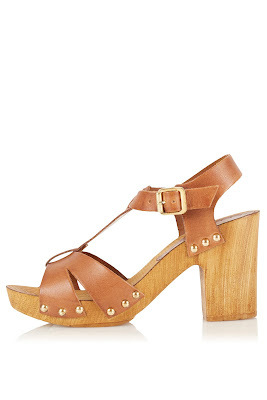 Or dress them up with the usual heels/blazer combo. Predictably Whistles are way ahead of the game, with several camouflage pieces in their new collection. This camo sweat dress (£95) is one of them. It's not any easy style of dress to wear in terms of shape but I can see it working for some, perhaps layered over skinny jeans in the winter, or with thick tights and heeled ankle boots/shoe boots. ...these fantastically bright yellow shoes from LK Bennett £85 down from £170, It's a great outfit for a late summer, early autumn event. I think that these shoes would look equally great with the blue GAP trousers above. 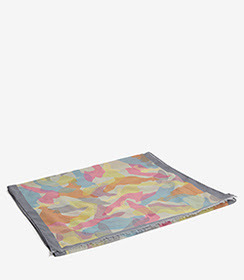 For something which is camouflage pretty much in name only, there's this printed scarf from Reiss (£14 down from £49), which is a great price and a good way to dip your toe into the camouflage water. 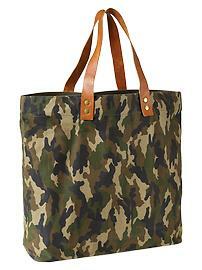 Lastly, this GAP tote (£39.95), whilst a very traditional camouflage print, is a good way of updating your exiting winter wardrobe, without spending a huge amount of money in doing so. True, you could probably get a pair of trousers from another brand for the same amount of money but GAP is bound to have some sort of discount soon. If I'm honest, I've always had reservations about wearing camouflage - it just doesn't seem quite right to turn clothing worn in conditions fraught with fear and danger, into a fashion item. I feel the same about wearing religious symbols and prints associated with particular cultures - that seems disrespectful. So, does the fact that I would wear a camouflage print in blue (the GAP jeans) or in pretty pastel colours (the Reiss scarf) rather than the GAP bag make me a hypocrite? Probably. But I can somehow get my head around those pieces more easily. As to how to wear camouflage, think less All Saints (as in the band, not the shop) utility trousers, desert boots and white vests and more fitted, glamourous and stylish. Having taken a look at what is out there has certainly opened my eyes to the possibilities of things to come. Hopefully it may have done the same for some of you too - or alternatively crystallised your view that never in a million years would you go there. If that's the case, I hope to be able to bring you some alternative trends over the next few weeks that may be more your cup of tea! An outfit for a night out with the girls (please note it was a Monday and we were all a bit tired)! For the first time since the children broke up from school, I had a few hours in the house on my own today. During that time I did several things, one of them being my best impression of Carole Middleton. From what I've read however, I don't think that she ironed her children's name tapes into their uniform, and she probably didn't do it whilst watching Neighbours on catch up. No, I imagine that a thimble and the Archers were more her kind of thing. Never mind. I'm pleased that they're done and at least these name tapes are ironed on. As the term goes on and the labels drop off, I resort to the sticky ones instead. 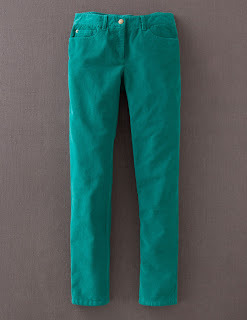 I'm always a sucker for a pair of non-jean, semi-smart trousers. With a couple of navy pairs to my name, I thought that I would branch out slightly and try these Brasserie trousers from Boden (£59) in pewter. I would describe them as more of a truffle colour but it all comes down to interpretation really. As to comfort, the first time that I wore these trousers I went out for dinner with some friends. I have to say that they were very comfortable and able to accommodate my tapas tummy quite happily! I bought this mint green cashmere jumper from an All Saints outlet shop a few weeks ago now. It was £40 down from £130 and is lovely and cosy for the slightly chillier summer evenings. I know that some of you also have hilarious husbands, as do I, and mine likes to tell me that I have it on inside out as the seams are on the outside. Sooooo funny. I quite like the colour combination of the jumper, trousers and bag, which was inspired by a striped towel that I bought from Ikea. I wasn't sure whether to own up to that or not but hey, inspiration can come from the funniest of places. Karen Millen's transformation - so far the signs are good! Probably like many of you, I had the new Karen Millen Autumn Winter 13 "lookbook" drop through my door today (photos interspersed below). More accurately it should be referred to as the Autumn Winter 13 campaign, with portraits by David Bailey. Inside it says that "Karen Millen is transforming." So the next obvious question to me was "into what?" But that's not a question that seems to be addressed. Rather it is a case of talking about the coming together of Karen Millen and David Bailey and their creative journey. I still haven't got to the nub of what the changes are really all about - although I have an idea and some hopes of my own as Karen Millen hasn't had a good overhaul for many years. Unlike Reiss and Whistles, brands that are comparable with Karen Millen price wise, I'm not really convinced that Karen Millen has ever found its style niche on the High Street. Or maybe it has but maybe it doesn't want to inhabit that particular niche any more. Whilst there's no doubting that previous collections did have some great staple pieces, I quite often felt that it was just a bit too try hard - a little short, a little too tight, a bit heavy on the animal print, a ruffle too far and quite often something perfect would be ruined when I turned it around and it was laced up at the back. I suppose it's always felt a bit trussed up, as though it needed to kick back and relax a bit more. It's odd that my path with Karen Millen should cross again so soon. When I recently started to think about what to wear to an upcoming 50th birthday party, the theme of which is "Out of Africa" (more about that after the event) Karen Millen was the store that really sprang to mind as having animal print pieces that would fit the bill. However is that what you would really want for your brand? For it to be the go to store for something animal print, slightly theatrical and a little OTT, to wear to a themed birthday party? So, as to the "transformation" I particularly like this jacket which is from the new collection. Whilst in the Karen Millen at Bicester at the weekend, I took a photograph of this jacket which is very similar. As I recall I think that it was about £130 and the sizing was quite snug. They did seem to have a good selection of stock though so it may be worth making enquiries for anyone who likes it enough to pursue it further - which I am now wishing I had done! So, what do we think ladies? Do we think that Karen Millen is due for an overhaul and if so, what do we hope to see. One thing is for sure, as you can see from these shots, plaid is going to be everywhere this winter and this dress could be a good place to start. The more I play around with clothes and accessories, the more I realise that certain things are pretty much guaranteed to elicit a response from people. I find this really interesting because it's almost as though humans are pre-programmed to respond to certain things in a similar way. Most often it's the colour of something that will bring about a comment. This is closely followed by whether something is sequinned or shiny. Other things that people comment on are if there's an unusual juxtaposition of pieces and of course handbags and shoes are always hot topics of conversation - but I suspect that's more of a girl thing than anything else! When I added the coral necklace that I am wearing in the pic below to my outfit just prior to going out the other day, my sister in law commented how much it made a difference and how it took a Breton striped jumper to a whole different level. And that's what I really like about £12.99 purchases from H&M - and any other fairly inexpensive purchase - they can make all the difference. The photograph above features in the September edition of Essentials Magazine. The magazine contacted me to ask me whether I would mind the photograph featuring and next to the shot they have re-created the outfit. The funny thing was that I was wearing sunglasses because it was at this point in time that I was sporting my black eye (for anyone who doesn't know the story I chose the wrong time to become involved in a game of catch between our son and my husband.) Bad move. On the basis of being asked to feature in Essentials, and because I'm fairly certain it would have been in part due to the necklace, I thought that I would do a round up of some necklaces that are available in stores at the moment. As the years go on, the choice gets even better so if these aren't for you, I'm sure that there are plenty that will be. 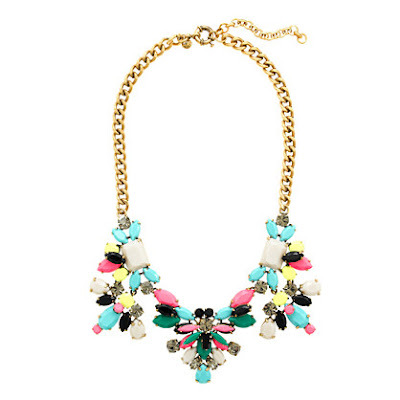 Kicking off with my old friend Zara I love the colours in this necklace which costs £19.99. The chartreuse colour looks great against a plain navy, black or grey jumper. 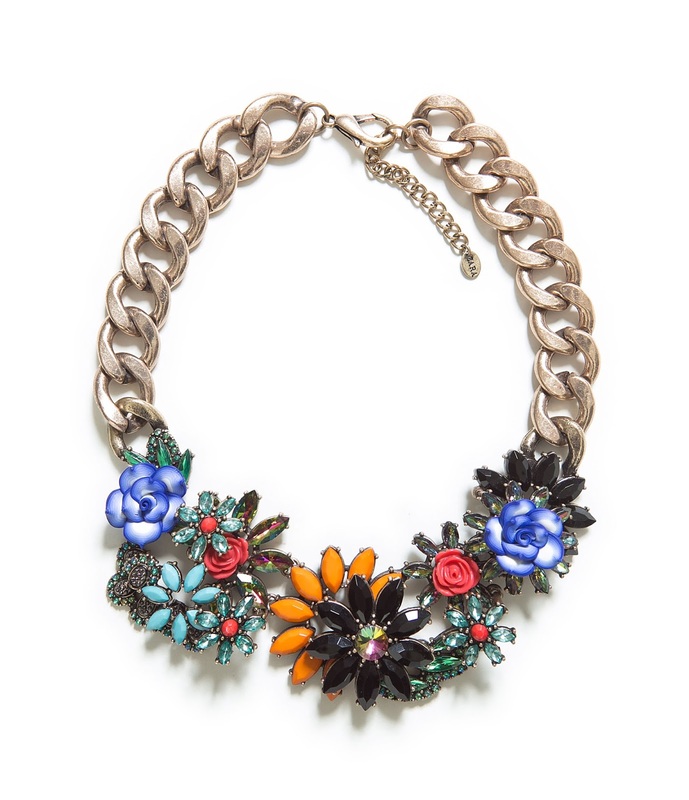 For something altogether more floral, Zara has this necklace for £29.99. Again, great for perking up a plain jumper, or a LBD for a night out. 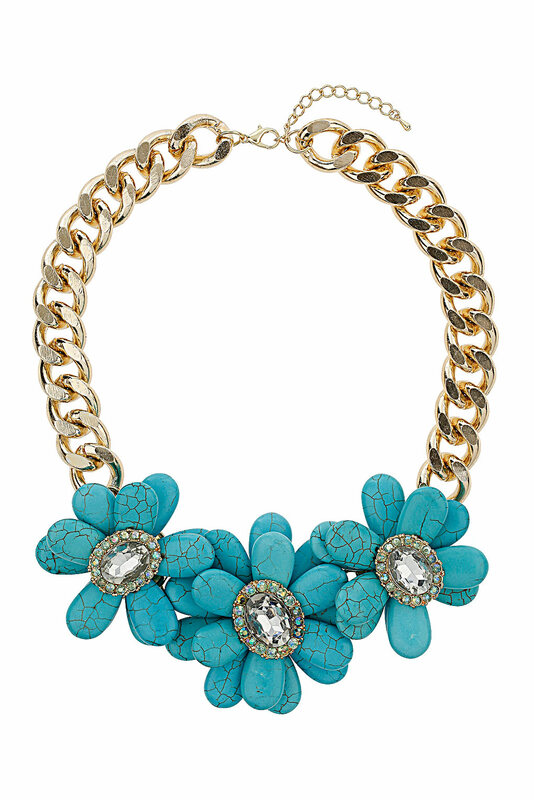 Turquoise can look stunning, particularly on people with blue eyes and this necklace from Topshop (£35) would be fantastic for adding a splash of colour to an otherwise very simple outfit, making it very chic. 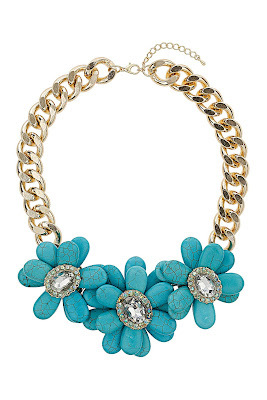 Another turquoise option is this Kate Spade necklace which I saw at Bicester yesterday - sorry, I can't remember the price but I think that it was around £70. A necklace with a ribbon tie, instead of a chain, like this one from River Island £12 is great for wearing underneath a collar on a plain blouse. It's a brilliant way of giving a whole new look to a trusty wardrobe staple and the length can be altered to fit your own needs. 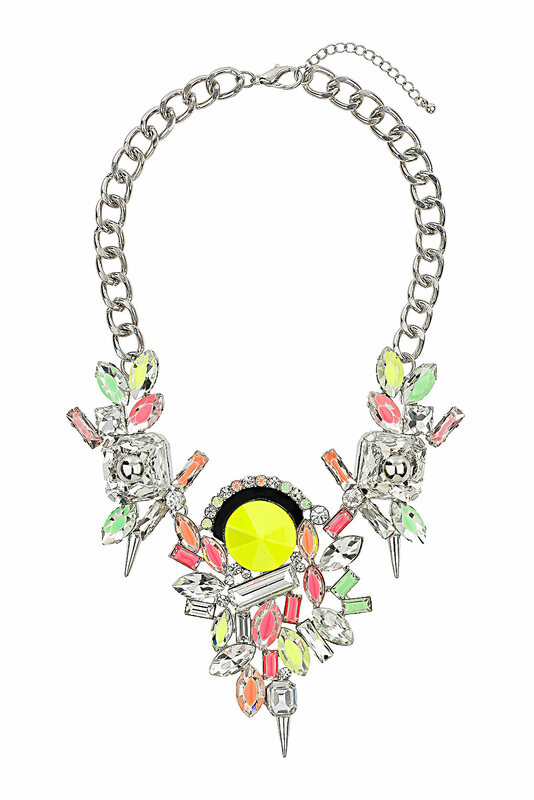 J Crew has a fantastic choice of statement necklaces. The colours in this floral necklace (£139.90) are so pretty I want to eat it. It's the kind of thing that would make me smile every time I wore it, which with it's bright and cheery colours, would be a lot. 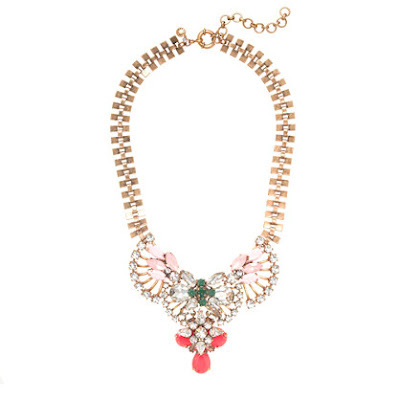 The J Crew crystal fan necklace (£122.94) comes in the colour way shown below (soft pink) or warm orchid, which is slightly more autumnal. As the drop falls to more of a point, it is a good design for drawing the eye into the centre of the body, and down, which is really flattering. 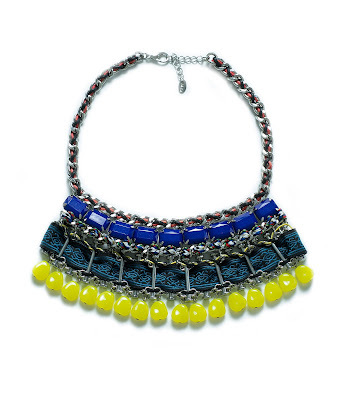 Many of the brands now do a selection of statement necklaces each season and some brands, like Whistles, will do the odd collaboration. I will often look to H&M first, along with Topshop, Oasis and River Island. Sometimes though it's more a case of not looking too hard but instead browsing shops on holiday and waiting for something to fling itself round your neck shouting "buy me, buy me." Then you know you're on to a winner.